Part of the reasons I love making macarons is that its possibility for concoctions is endless. You can create flavours, colours, looks and textures the way your heart desires. Let your imagination runs wild. I have been toying with the idea to include ground ingredients other than almond meal in macaron shell. One of the thing I was thinking was sesame seed. I love sesame seeds. I love its nutty aroma, especially when it is roasted or being cooked. The aroma is wonderful and so tantalizing. I chose to work with black sesame seeds because the colour would add a nice touch to the shell. Black sesame seeds also have more intense flavour and aroma. Moreover, its health benefits are more superior than its white counterpart. The seed is full of calcium, iron, copper, magnesium and phosphorous, which help support healthy bones, muscles, blood and nervous system. It is also used in Chinese medicine to promote health of kidney and liver (source: www.ehow.com). Black sesame seed macarons sound like a treat for you and your soul. Sesame seeds were pan-roasted over low-medium heat until they were aromatic and then grinded for use in the macaron shells and filling. This is one of the tastiest macarons I have made so far. The aroma was sensational when the macarons shells were getting baked. It sure will please anyone, especially the black sesame lovers, like myself. I love the speckle of black sesame in the shells as well. They are visually appealing. I find that the shells made with black sesame seeds are slightly stickier than usual and wonder if it is because of its oily attribute or they needed more time to cook. However, it was minor issue. The shells came out nicely. Taste delicious. It was an excellent change from usual almond meringue cookie. With black sesame seeds, it is also a somewhat healthier macaron option as well...at least, I'd like to think so. Submitting this post to Weekend Herb Blogging hosted by Winnie from Healthy Green Kitchen. Roast black sesame seeds in the heavy-base pan over low-medium heat until they are aromatic. Regularly shake the pan to ensure the seeds are not getting burnt. 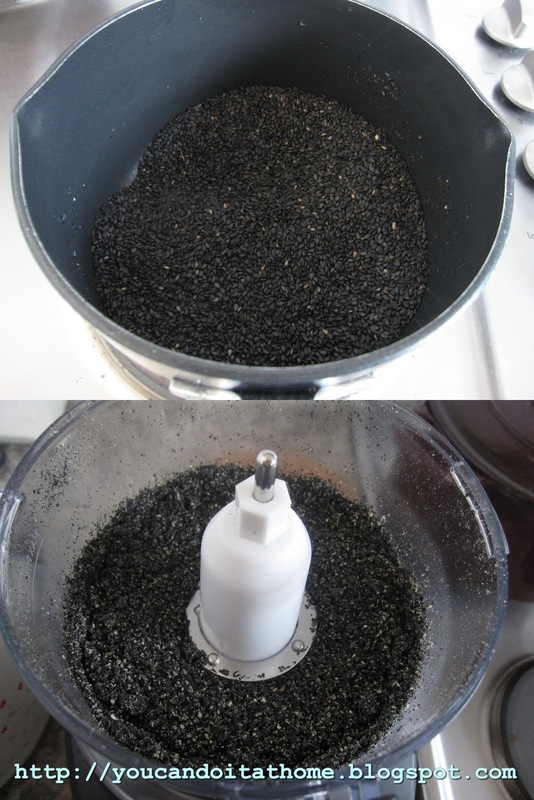 Grind roasted sesame seeds in food processor until finely ground. Divide into two portions for making shell and ganache. Sift almond meal, 40 g ground sesame seeds and icing sugar together through fine sieve and set aside. Divide egg whites into two equal portions (50 g each portion). Pour the first portion of egg white (50 g) and black colouring powder (if using) into the almond meal/icing sugar mixture. Don’t mix or stir them, just leave it as is. Put the water and caster sugar in a heavy-base saucepan over medium-high heat. When the syrup start to boil. Place the rest of egg white (50 g) into a mixing bowl, using the whip attachment, whip egg white to the soft peak. When the syrup reaches 118°C (on a thermometer), take if off the heat and let it cool down to 115°C (or until the bubbles subside). Continue mixing until the meringue cool down to slightly above body temperature (50°C) or when the side of the mixing bowl is warm to touch. The whipped egg white will be (very) stiff and glossy. Put the mixture into a piping bag fitted with 1-cm plain tip (size #11). Pipe the staggering rows of 1-inch rounds onto baking papers or baking sheets. You will need two trays for this recipe. Let the piped shells stand at room temperature for 30 – 60 minutes to let the crust forms. This depends on the room temperature and humidity. When the piped shells are dry to touch without it sticking to your fingers. They are good to go into the oven. Preheat the oven to 160°C (fan-force or convection oven, increase the temperature by 20°C if you’re using conventional oven) for at least 15 minutes. Just before baking, turn the temperature down to 150°C and bake the macarons for 15 minutes. Sandwich cool macarons shell with chilled black sesame chocolate ganache. Store macarons in airtight container in the fridge. Macarons will taste better after they are chilled overnight. Put white chocolate in a separate bowl. Bring cream to the boil in a small saucepan over medium heat. Remove it from heat as soon as it comes to the boil. Pour hot cream into chocolate. Leave it for about 10-20 seconds. Stir the chocolate and cream mixture until melted. Scatter butter pieces on the mixture and stir until well combine. Mix through ground black sesame seed and salt until all combined. Chill the ganache at least an hour before using. Thanks for the information on black sesame seeds. I was not aware of the difference from the white ones. Your macarons look and probably taste fantastic. These macarons taste great. It's one of the most delicious I've made so far. They're also different flavour from the normal ones too. 1. which method that you would recommend, French or Italian? If you have cooking thermometer, I suggest going for Italian meringue. It gives more predictable result, shiny and smooth shells. It is also much less likely to overmix the batch. Thickened cream is cream used for whipped cream. The packaging label usually tells you what percentage of fat in the content.